The exterior of your shop is one of its most important features. First impressions count and it’s vital to ensure your premises look inviting and modern, with easy access. Automatic Access manufactures and supplies complete shop fronts including windows, lighting, curtain walling and shop front doors. Our products are manufactured in powder-coated, glazed aluminium or stainless steel to suit clients’ individual requirements. To ensure that we can provide a bespoke solution to fulfil every requirement our expertise extends to sliding doors, revolving doors, swinging doors, telescopic doors, balanced doors and bi-folding doors. Each style has its own unique benefits and we’re happy to offer free site surveys and access audits to enable our customers to make an informed choice. Sliding doors are ideal for premises that require an easily-accessible entrance; considering the needs of disabled customers too. The Disability Discrimination Act stipulates that all public buildings must take measures to improve accessibility for everyone. Our swinging doors can be manufactured with either double or single leaf. 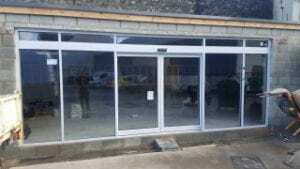 We’re able to provide fully automatic or low energy swinging doors. Revolving doors are ideally suited to buildings that have a high footfall such as shopping centres and supermarkets. Saving on energy by reducing heat loss, they are a particularly efficient means of stopping draughts. Telescopic doors are ideal for narrow openings, incorporating an additional sliding door active leaf to optimise the available space. They can provide up to 30% more opening width without taking up any extra room. Bi-folding doors provide a modern, contemporary feel for your premises. Creating a seamless link between the interior and exterior areas, they are also ideal for areas where space is tight. Once you’ve decided on your choice of shop front doors, why not let Automatic Access redesign your whole shop front? With the correct entrance, you can communicate the appropriate message to visitors as soon as they arrive at your premises – let them know you’re a professional, modern business. Automated entrances are becoming increasingly popular, immediately creating a positive impression for customers. Our high quality, stainless steel finish automatic entrances are a firm favourite, providing a smart, welcoming and contemporary feel. A recent survey by a trade magazine revealed that a massive 95% of customers would be influenced by a business’s exterior. In fact, 52% of those surveyed said that if the exterior looked uninviting, they may be deterred from entering. Even the most competitive pricing and best customer service may be irrelevant if your shop front lets you down before people set foot in the door. Don’t take the risk of losing customers because your shop front doesn’t give a good impression. Contact Automatic Access for a no-obligation chat with our knowledgeable, friendly advisors and open the door to success with our bespoke solutions.